The National Association for Business Resources annual Best and Brightest Awards are intended to highlight outstanding organization from the Chicago area. Royal Cyber has been named as 2016 Chicago’s 101 Best and Brightest Companies to Work For by the National Association for Business Resources. The CIO Solutions magazine has issued a special edition on DevOps Solutions. In this context the CIO Solutions team has screened numerous companies and subsequently certified 25 companies, out of which Royal Cyber has been recognized as top 25 DevOps companies. This award recognizes the IBM Business Partner solution or integration that delivers an enterprise modernization solution that helped customers extend the value and performance of existing software assets, skills, and processes. The solution must demonstrate exploitation of System z, Power or Application Migration portfolios to solve traditional business challenges in innovative ways. Royal Cyber Inc has been selected for the 2014 Best of Naperville Awards for demonstrating the out of the box and unmatched marketing methods to grow our business regardless of today’s tough and competitive economic era. Royal Cyber, made it’s way to 2013 Inc. 500|5000 List of the fastest-growing private companies in America. Royal Cyber Inc, is an IT Consulting Firm accelerating Innovation for its customers. We Royal Cyber Inc, power the enterprise software for over 20% of the Fortune 1000 firms.We have over 400 customers spanning Globally and have over 600 employees worldwide. We are growing at a CAGR of 50% (2 years).We are quickly emerging as leaders in the Enterprise Software Consulting Space. Royal Cyber nominated two of its clients for Royal Cyber’s Smarter Commerce implementation and won the best Smarter Commerce Sell Award 2013 for its proficient implementation of e-commerce solutions on those clients. Royal Cyber set another exemplary excellence by winning IBM Impact Mobile Innovation Award 2013 at Impact 2013 held on 28th April, 2013 at Las Vegas, NV. 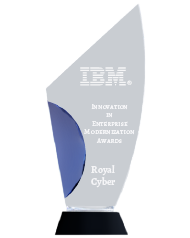 Royal Cyber made its way to IBM’s Beacon Award 2013 Finalists by providing unmatched and quality smarter commerce solutions to small and large enterprises all across the globe & making the e-business simpler than ever before.